An officer of the Imperial Guard charges into battle in this unforgettable masterpiece by Gericault. With its wide rich border, “Cavalier de la Garde Imperiale” offers a sense of realism tempered by romance as the officer rears on his horse, saber in hand. Taught by the French painter Guérin, Jean Louis Andre Theodore Gericault’s work in this piece is unmistakable. Each of his paintings is a careful blend of romanticism and realism. The detail of his work is impressive and dramatic, and this piece celebrates the cavalry in its finest hour. His work was so well regarded that others used his work as a guide for their own works, creating the Realism movement in art after his death. 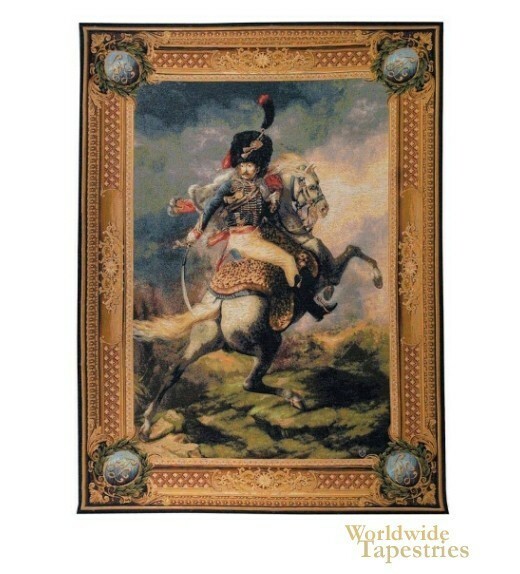 This tapestry faithfully reproduces “Cavalier de la Garde Imperiale” in all its visual splendor. It is lined and has a tunnel for easy hanging. Dimensions: W 44" x H 58"
Dimensions: W 58" x H 78"